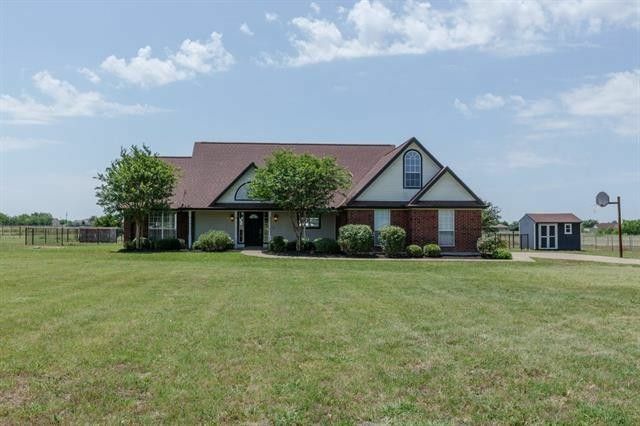 This charming country home features an open floor plan perfect for entertaining family and friends. It sits on a spacious 3-acre parcel with serene countryside views. The welcoming covered front porch is the perfect spot to enjoy a cool beverage from your rocking chairs. The Foyer boasts hardwood flooring that extends through the Family, Dining and Master Bedroom. The Family Room is the heart of the home and features a vaulted ceiling. The Dining Room offers a 3 pendent oil rubbed bronze light and tranquil views of the cross-fenced back acreage. The Kitchen is open to the Family and Dining Rooms and includes lots of counter and cabinet space along with black appliances. The Master Suite is split for privacy and includes a tray ceiling, built-in shelving and a large walk-in closet. Its nicely appointed bath contains His & Her vanities, soaking tub, separate shower and linen closet. The Secondary Bedrooms are located on the opposite side of the home and share the Hall Bath with dual sinks and separate wet area. The upstairs Bonus Room would make a perfect Home Office, Game, Play or Craft Room. The 2-car side entry garage has a storage closet, garage door opener and extended swing driveway. The covered patio with flagstone extension is the perfect spot for outdoor entertaining. There’s also a rustic pergola, dog run, and storage shed. Bring your horses! Directions: From I-30: West on FM 1565, Right on SH 66 for .3 miles, Left on FM 6 for 1.85 miles, home on left, SIY.